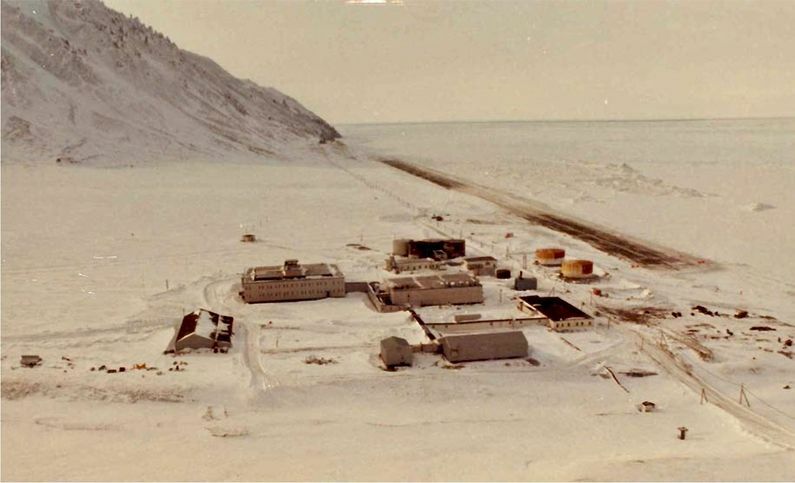 Cape Lisburne Air Force Station (1953-1983, 1985-Present) - A Cold War U.S. Air Force Station, part of the Alaska AC&W Radar Network. Initially functioned as an Early Warning radar site, with a Permanent System ID of F-07. Later redesignated a surveillance site feeding manual track data to the Campion Direction Center and later to the Murphy Dome Direction Center. The site became a minimally attended radar site in 1985 and was redesignated as Cape Lisburne Long-Range Radar Site with a JSS ID of A-13. Now feeds radar track data to the FAA Anchorage ARTCC (ZAN) and to the Elmendorf NORAD Regional Air Operations Center (RAOC). Active Long-Range Radar Site (LRRS) with an FAA ID of ZLUR..
Cape Lisburne Air Force Station Top Site 1960s. White Alice to the Right, Radar Dome to the Left. The site for Cape Lisburne Air Force Station (AFS) was surveyed in 1949 by the AAC and the U.S. Army Corps of Engineers. In June 1950, a construction contract was awarded to Gaasland & Company Cape for Lisburne Air Force Station. Construction started on 21 Jun 1951. The company completed both the upper and lower camps and a connecting aerial tramway in August 1952 at a cost of $4,468,751. The site became operational on 11 Feb 1953 as Cape Lisburne Air Force Station manned by the 711th AC&W Squadron which had been activated on 8 Dec 1952 to operate and maintain the site. The site was initially built without weatherproof connecting walkways between buildings and those were added in 1954. The site was designed for 89 personnel with a standard 21 wood frame building plan, each building designed for a 15-year life expectancy. The early site was plagued with chronic water shortages because of frozen reservoirs. These shortages along with the wood frame construction of the early site and the wood frame hallways connecting all the buildings led to a series of fires that resulted in serious damage to portions of the lower site. The first serious fire occurred on 26 Mar 1954 and destroyed the orderly room, dispensary, and the BOQ. The water lines on the fire truck were frozen and water could not be used to fight the fire, the fire extinguishers were also expended without effect. The remainder of the site was saved by bulldozing critical connecting hallways. This technique would have to be repeated for several fires that followed. All the records in the orderly room were lost and had to be recreated. A fire on 16 Nov 1956 destroyed the transmitter building and on 17 Feb 1957, another fire destroyed the commissary. The most serious fire occurred on 19 Dec 1962 when the mess hall caught fire and it spread to the BOQ, both were destroyed and again the bulldozer saved the rest of the site. The mess hall was moved into the motor pool building but it took until June 1963 to build a new mess hall. The fire danger was not alleviated until new composite buildings were built at Cape Lisburne in 1968, using steel-frame, sandwich-panel construction for the first time in the Arctic. 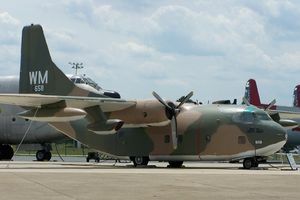 Fairchild C-123K Provider, the same type of aircraft that Crashed at Cape Lisburne Airstrip. There were several aircraft accidents on and near the gravel airstrip that the served the site. The approach to Lisburne was described as "the hariest landing strip in the world". Planes approaching the airstrip must make a sharp turn and head into the face of a mountain while fighting heavy crosswinds. Two of the accidents involved fatalities. The worst was the loss of an Air Force C-123 on 16 Jul 1966. The plane was bringing supplies and a USO show to the site and it crashed in the sea on landing approach. All nine aboard were killed, seven military and two civilian USO entertainers from Los Angeles (Hugh H. and Elinor Yancey). Only two bodies were recovered. An earlier accident occurred on 26 Jan 1963 when a Skyvan Airways Curtiss C-46F-1-CU Commando flying from Kotzebue Airport crashed into the sea while trying to execute a go-around. The aircraft rolled inverted and crashed into the Chukchi Sea approximately 150 yards offshore. Both pilots survived the crash, but one of them drowned in the 27-degree water. Cape Lisburne Air Force Station Lower Site in 1981 after the Composite Buildings were Built. Note the Airstrip on the Right. Initial equipment on 11 Feb 1953 included an FPS-3 search radar. The FPS-3 radar was upgraded with a GPA-27 modification kit to an FPS-20A search radar during the summer of 1958. Also in 1958, the far more capable UPA-35 radar scopes were installed. Later in the 1960s, the FPS-20A was upgraded to a FPS-93A search radar. Aircraft track data from these radars was manually plotted on plotting boards and passed to the Murphy Dome Manual Direction Center on voice circuits. In 1965 the FYQ-9 Semiautomatic Data Processing and Display System was implemented on Alaska AC&W radar sites automating the passing of track data to the direction centers. The result was reduced manpower requirements and increased efficiency. Further reductions came on 1 Oct 1977 when the Alaska Air Command (ACC) contracted with RCA Services for site support services. This was a part of an Air Force effort to reduce remote tours. Some 94 military positions were originally authorized and that was reduced to 15 military positions that were primarily in operations. JSS FYQ-47 common digitizers were installed on the AC&W radars sites, including Cape Lisburne, by 1982. This upgrade enabled transmission of radar track data via satellite to the new Elmendorf JSS Regional Operations Control Center (ROCC) near Anchorage. The Elmendorf ROCC was activated on 14 Jun 1983 and that event triggered a series of events that included the closure of the AC&W sites, the disbandment of the AC&W Squadrons, the creation of Long-Range Radar Sites (LRRS) with full contractor operation and maintenance and new FPS-117 3D radars. The Cape Lisburne AFS was deactivated on 1 Nov l983 even before the FPS-117 radars were installed. Cape Lisburne AFS was also the site of a DEW Line radar site designated LIZ-1 although it did not have any of the normal DEW Line radar sets installed. The track information from the then active FPS-20 at Cape Lisburne AFS could have been used as an adjunct to the other Dew Line radar sites as some sources indicate but others think that the designation is simply because of an FRC-45 troposcatter radio link to the LIZ-2 Dew Line Radar Site site at Point Lay. The site was listed as an active DEW Line facility from August 1957 until 1 Jun 1969. A new FPS-117 Minimally Attended Radar (MAR) was installed was installed between May-July 1985. The site was operational on 3 Jul 1985 and re-designated as Cape Lisburne Long-Range Radar Site (LRRS) operated and maintained by contractors. The Long-Range radar site was connected to the Elmendorf JSS Regional Operations Control Center (ROCC) which was activated on 14 Jun 1983. The FPS-117 radar fed data to the ROCC FYQ-93 computers via satellite. By 2011 the MAR FPS-117 radars were outdated and increasingly unsupportable because parts and components were no longer available. In 2011 the U.S. Air Force awarded Lockheed Martin $46.8 million in contract options to begin modernization of 29 long-range radars. Under the EPRP contract, Lockheed Martin was to modernize 15 radars in Alaska including Cape Lisburne. The last FPS-117 site was upgraded in June 2015. The physical plant of the site was originally divided into an upper main site and a lower cantonment site. The upper main site housed the radar towers and the backup generators. The lower cantonment area housed the operations area, the enlisted quarters (BAQ), the bachelor officer's quarters (BOQ), the orderly room, the dining hall, and other support areas. The two sites were connected by an overhead tramway and later by a road. The tramway was decommissioned in 1971. No family housing was provided as this was considered a remote unaccompanied tour (1 year). Cape Lisburne AFS Original Plan for the AC&W Lower Site. An airstrip was added in 1953. In 1955, the upper camp was improved to include 12 person crew quarters and an inflated radome. The inflatable radome was replaced in 1961 with a rigid radome. In June 1965 the AFS had 26 buildings including both the upper and lower camps. The new main composite building (No. 150) was constructed starting in 1968 and occupied in June 1970. The composite building had a two-story foyer with colorful interior and lavish lighting. The building cost $6.5 million to build in 1968-70. Annual resupply of the site was accomplished in the summer month by a sealift program known as Mona Lisa, later Cool Barge, until 1995. A good portion of the Cape Lisburne installation was demolished in 2001 and 2002. Separate radio facilities housed the radio equipment for communicating with aircraft. The Cape Lisburne White Alice troposcatter site was activated on 29 Aug 1957 after one year of construction. The site was linked by 2-60' tropo antennas to the Kotzebue White Alice Communications Site (168 miles) and to Point Lay DEW-Line station by 2-30' dish antennas. The equipment and power building was a 2,960 square-foot facility. 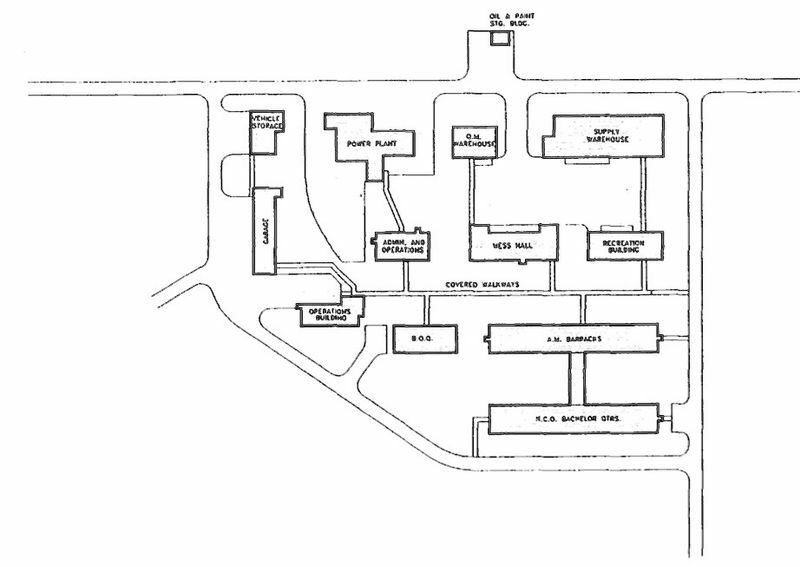 This WACS facility was located near the upper radar tower site. White Alice site was inactivated in May 1979 and replaced by an Alascom-owned satellite earth terminal. The main source for this list is from Major Ohlinger's History on the Radomes website above with the addition of four other names from various sources and some additional dates. Active long-range radar site but most of the old AC&W site buildings have been demolished. The site has also had an environmental remediation project that has further erased signs of the old AC&W site and the White Alice tropo site. Most of the AC&W site buildings were demolished in 2001 & 2002. See the list below for remaining facilities as of 2010. No. 200 - Water supply tank. Location: Near Point Hope in North Slope Borough, Alaska. Denfeld, D. Colt Ph.D., The Cold War In Alaska: A Management Plan For Cultural Resources, 1994-1999, U.S. Army Corps of Engineers, August 1994, 327 pages, Pdf, page 150-151, 187, 230. History of the Aircraft Control and Warning System in Alaska: Air Defense of Arctic Skies, Argonne National Laboratory, Illinois, 2002 updated 2013, 140 pages, Pdf, page 43-47. Reynolds, Georgeanne Lewis, Historical Overview And Inventory: White Alice Communications System, U.S. Army Corps of Engineers Alaska District, April 1988, prepared for USAF, Alaskan Air Command, Elmendorf Air Force Base, Anchorage, Alaska, 16 pages, White Alice USACE, page 13. This page was last modified 10:15, 28 December 2018 by John Stanton.